Beautifully perfumed and deeply coloured red, rich and supple. Sweet-fruited, with concentrated plum/spice flavours, silky tannins and great harmony. An extreme cool climate Pinot Noir from one of the world's southern-most vineyards. This vintage tends to exhibit higher acidity at the moment due to its youth but will soften beautifully as the wine ages. NOTE: This 2013 vintage is still considered relatively YOUNG and can develop for another 5 years. To drink now, please decant for an hour prior to drinking to bring out the best of this wonderful Grasshopper Rock. Grasshopper Rock was established in 2003 and dedicated exclusively to pinot noir. The vineyard enjoys high sunshine hours by day and very cool temperatures by night and is sufficiently harsh and difficult, making the wines work their hardest. With extremes of heat and cold comes the risk for spring and autumn frosts, providing a demanding but rewarding environment for the production of premium pinot noir. Our predictions that 2013 was going to be a cool season were right but it did end up better than we expected and closer to an average season, at least in terms of overall heat. The extremely cool spring resulted in reduced flower development. However a perfect period of fine warm weather for flowering in late December meant nearly every flower became a berry. The late harvest we were expecting was not quite so late due to a couple of month of above average temperatures in February and March – which we were very thankful for. Read the full awards and reviews of GrasshopperRock 2013 here. "Fine, pretty nose; pure and ripe, blessed with layers of toasty oak, raspberry, strawberry and just a hint of chocolate and spice. To taste it's no less toothsome, with sparkling intensity and vibrancy, delivering reams of cinnamon-kissed, creamy red fruits. Beautifully poised and with great tension." Moderately dark ruby-red colour, with light purple hues on rim. The nose is gently full with rich, ripe fruit aromas of dark cherry and raspberry fruits harmoniously interwoven with thyme herb notes and subtle oak elements. Some raspberry liqueur detail unfolds with aeration. Medium-bodied, the palate features a soft-textured, smooth and integrated core of ripe, dark raspberry fruit entwined with thyme herbs and a hint of minerally reduction. The fruit has a gentle sweetness and lusciousness balanced by supple, fine-grained tannins. Soft acidity enhances the seamless flow and the wine carries to a very long, sustained finish with dark cherry notes and refined tannin textures. This is a supple, smooth-flowing and harmonious, sweet-fruited Pinot Noir with real beauty. Match with poultry, pork and Asian fare over the next 5-6 years. Pinot Noir clones 5, 777, 115, 114, Abel and 667 destemmed and fermented to 13.0% alc., the wine aged 10 months in 30% new French oak barriques. 18.5+/20, 5 STARS, Mar 2015. OUT OF STOCK! Attractive wine with strong, bright plum and dark cherry flavours. Moderately con..
Rich, elegant and moreish, with pretty secondary notes of earth, smoke and bacon. Captivating s.. The bouquet is elegantly presented with good intensity of ripe strawberry fruit lifted by red f.. Bold, fresh, direct, elegant and balanced. It delivers rich cherry, plum and dark berry fruit n..
Silky soft and seductive yet wonderfully concentrated, this wine is pretty without pretence. Fr.. Dark plum and cherry aromas, with subtle hints of spice. Ripe and rich layers of fruit on the p..
Power house of rich, dark aromas and flavours. Plum, black cherry, licorice, spice, black curre.. 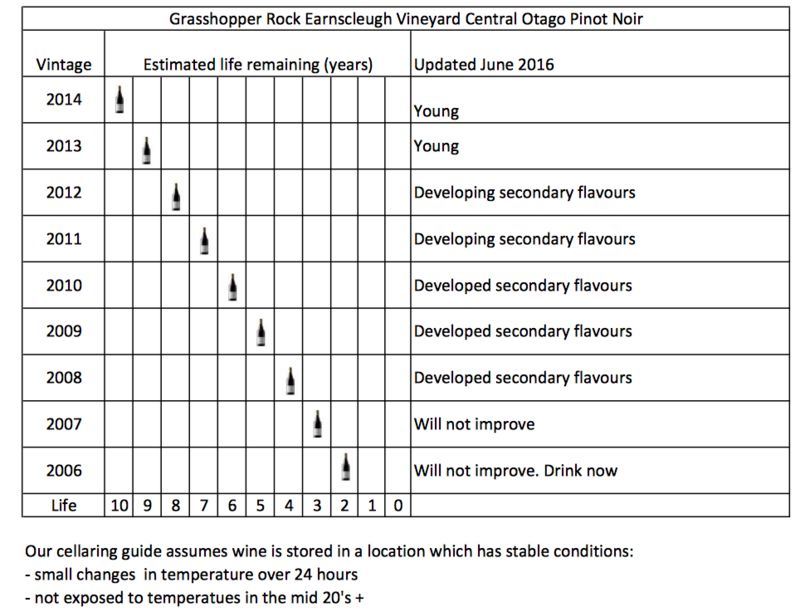 This Pinot Noir shows the influence of the Wairau Valley's unique climate and complex soils. Th..
Heady scents of ripe summer strawberries make a lovely first impression, while hints of crushed..